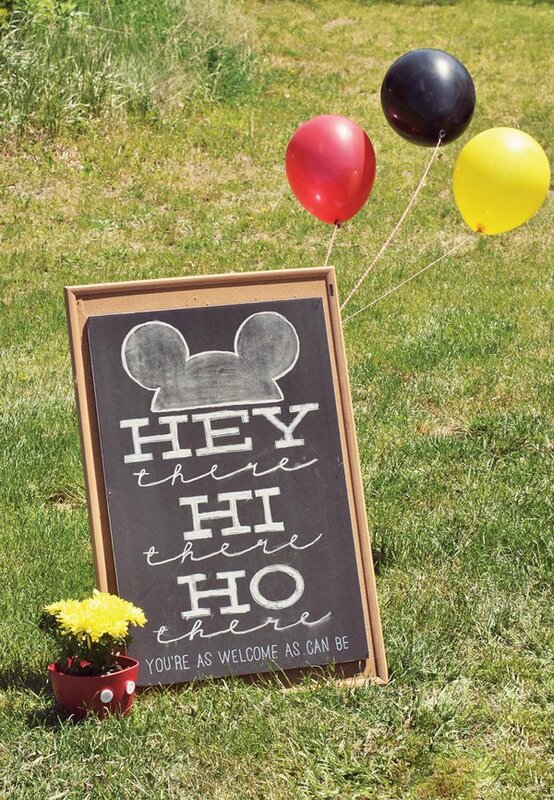 “Smile from Ear to Ear” and more clever chalkboard party signs! This was the first year my little guy became really involved in the planning process for his birthday party. (Really involved.) 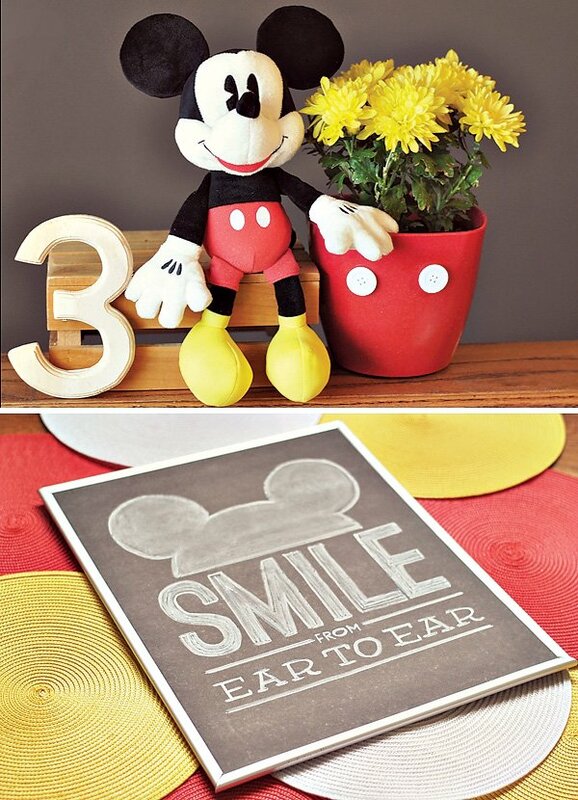 As soon as we began discussing theme ideas, my almost-three year old instantly settled on Mickey Mouse. He had an opinion on just about everything from the colors to the food & we did our best to make sure his requests were met in order to make his “Happy Day” extra special. 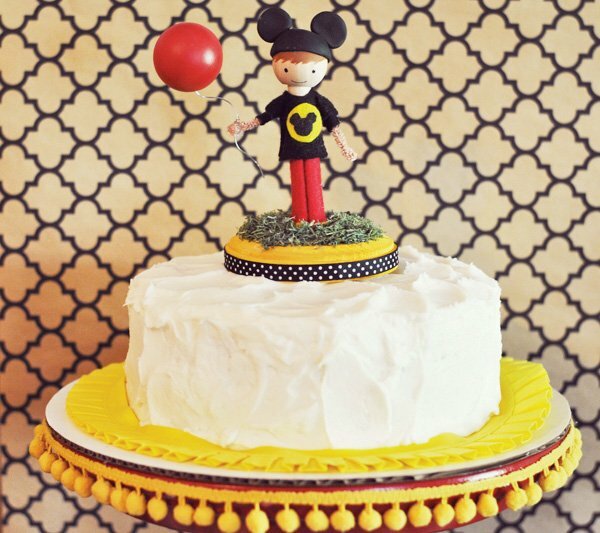 During the early stages of planning, I decided I wanted to do something a little different for his Mickey party. 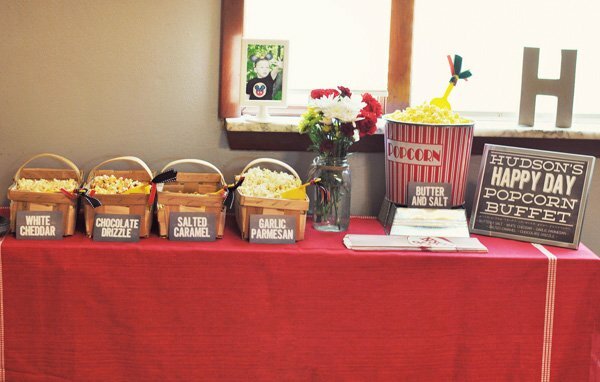 While I stuck to a traditional color palate of red, yellow & black, I incorporated unexpected neutrals like kraft paper, chalkboards, burlap, & wood throughout the party to give it a bit of a crafty, handmade feel. I also incorporated many nostalgic aspects from the original (1950’s-60’s) Mickey Mouse Club that many of our guests (grandparents, aunts & uncles) instantly recognized. I love it when everyone at the party is “in on” the theme. We used the classic black & white Mickey throughout the decorations. The kids were thrilled that Mickey Mouse was involved, and the adults liked reminiscing about a beloved character they grew up watching. 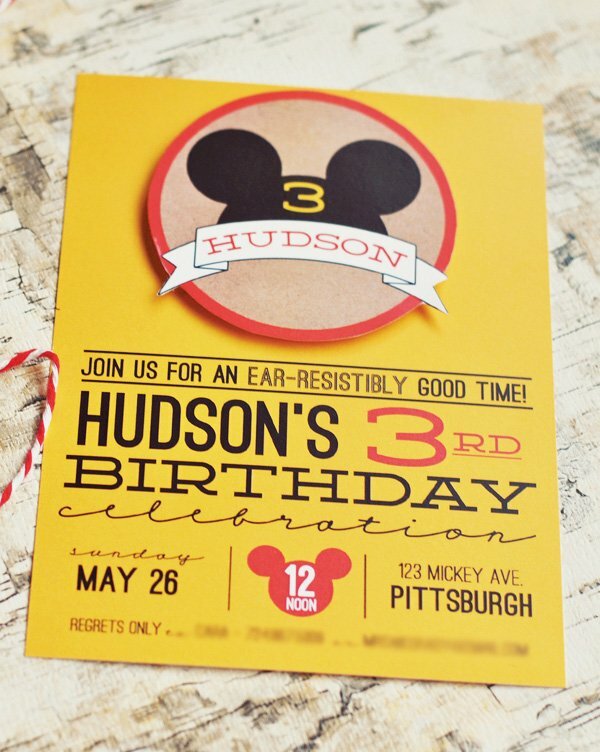 Hudson’s invitations asked guests to join us for an “EAR- resistibly good time” and featured a custom Mouseketeer hat design that would also be found throughout his party. The invitations were mailed in kraft envelopes with coordinating washi tape & a vintage-inspired return address sticker. 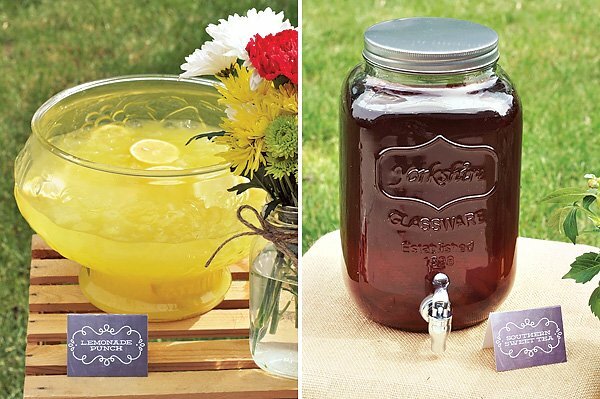 The guests’ address labels were designed to look as though they had been created with an old-school label maker. As they arrived on the big day, our guests were greeted by a hand painted chalkboard sign that read “Hey there, Hi there, Ho there! 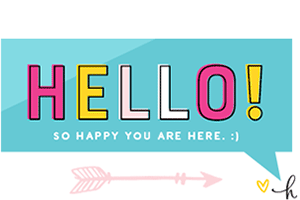 You’re as welcome as can be!”— lyrics from the original Mickey Mouse Club theme song. Red, yellow & black balloons were tied to the sign using bakers twine instead of curling ribbon—a last minute change that I ended up loving. I made a wreath for our front door using polka dot fabric, felt flowers & a cute pennant bunting. Mason jars filled with fresh flowers from our local farm market were scattered throughout the house & were the perfect little extra to tie in the party colors. 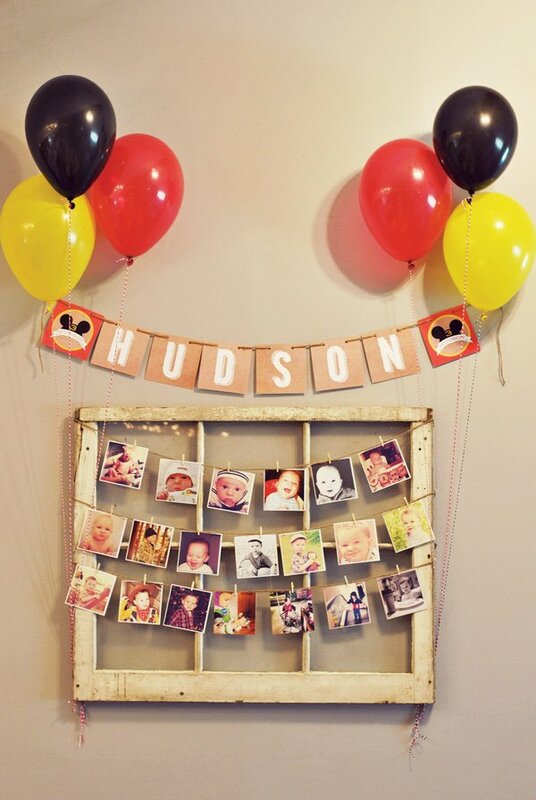 Using a reclaimed window from an old barn, my husband & I created a frame to display Instagram pictures of Hudson. Each 4×4” photo was clipped to jute twine using a miniature clothespin. 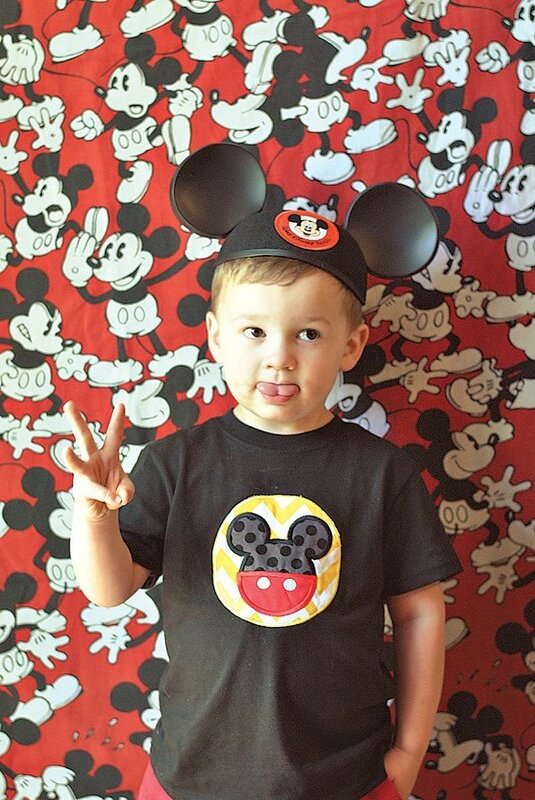 The birthday boy greeted guests wearing a custom embroidered Mickey t-shirt & red shorts to mimic Mickey’s look. Of course, his Mouseketeer ears hat topped off his ensemble. Hudson made it very clear early on in the planning process that he would be the one choosing the menu. 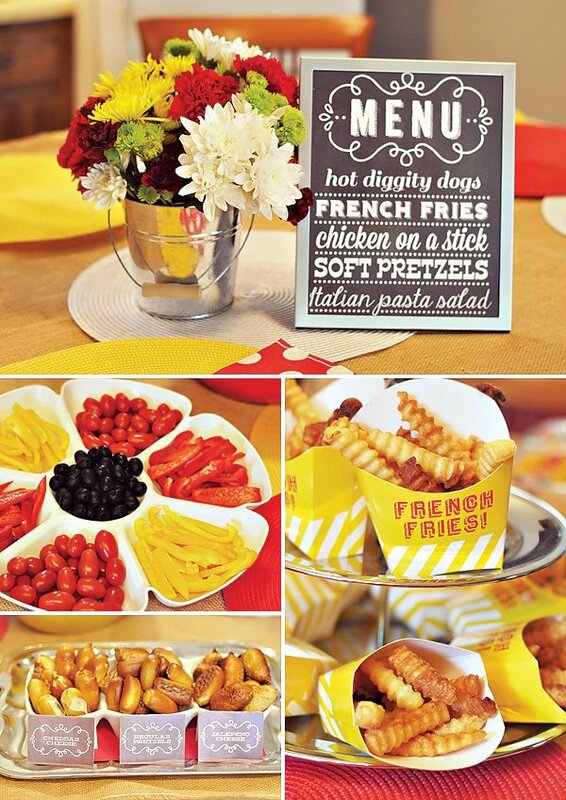 We went with his choices & served hot dogs, French fries (in adorable, coordinating fry boxes from Target), soft pretzel bites, chicken on a stick & Italian pasta salad. Crafty-looking fruit cups were made by placing cut pineapple, strawberries & blackberries into miniature seedling pots tied with baker’s twine. They were almost too cute to eat. Almost. We also had a color-scheme-friendly veggie tray with red & yellow peppers, cherry tomatoes & black olives. 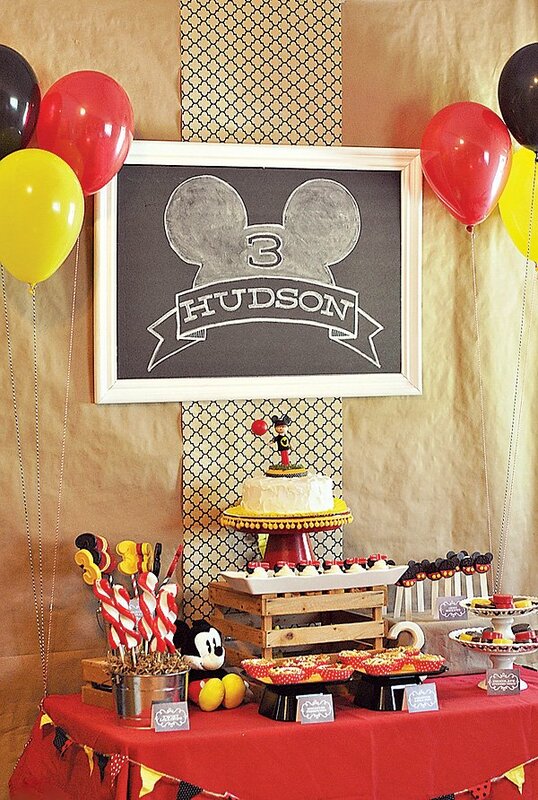 Using a backdrop of kraft paper & quatrefoil wrapping paper, Hudson’s dessert table was the focal point of the room. 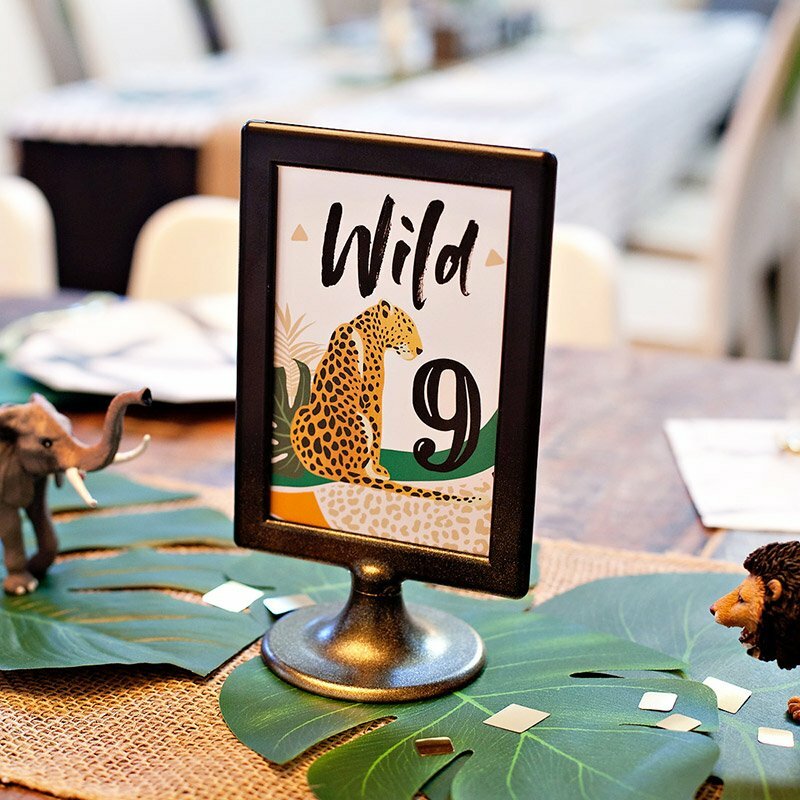 A framed chalkboard, with the same design used on the invitations, was hung above the table. I used wooden crates & boxes wrapped in kraft paper to give the desserts a bit of a height element. 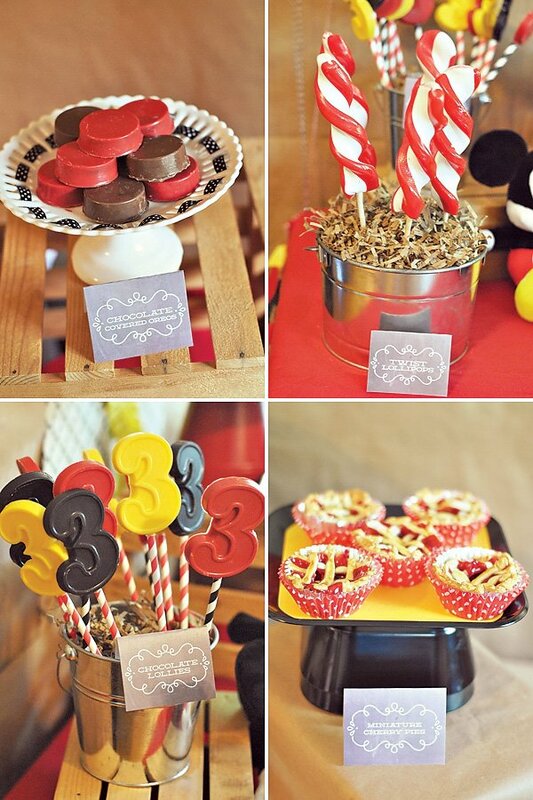 The table featured Hudson’s favorite special treats—lollipops and Oreos. Playing off of the vintage/rustic theme, I baked miniature apple & cherry pies and placed them in the polka dot cupcake wrappers. I used canned pie filling & frozen pie crusts to make this as easy as possible. There was only one pie left by the end of the party! I made a cake stand to hold Hudson’s cake using a terracotta pot & base. It was a super easy & budget-friendly DIY project that was exactly what I had in mind. I embellished it with some yellow pom-poms for some added color. We ordered a simple rough-iced vanilla cake from our favorite local baker & topped it with some ruffled fabric trim & a clothespin figurine made to resemble the birthday boy himself. (The cake topper was, by far, my favorite party detail.) I really love using a very simple cake & adding something extra to make it fit right into the party. After the candles were blown out, the cake was served. 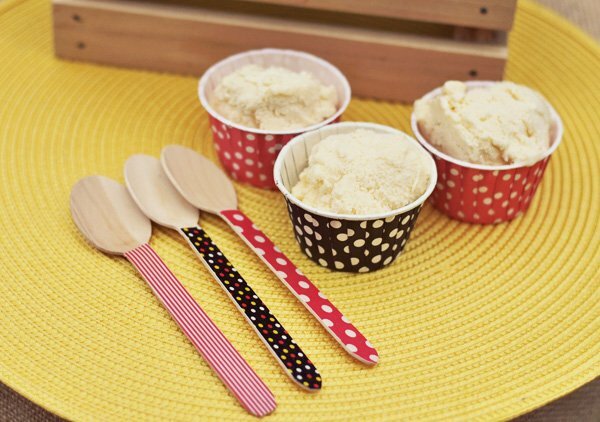 We also enjoyed vanilla ice cream in polka dot cups along with cute & coordinating washi tape covered wooden spoons. 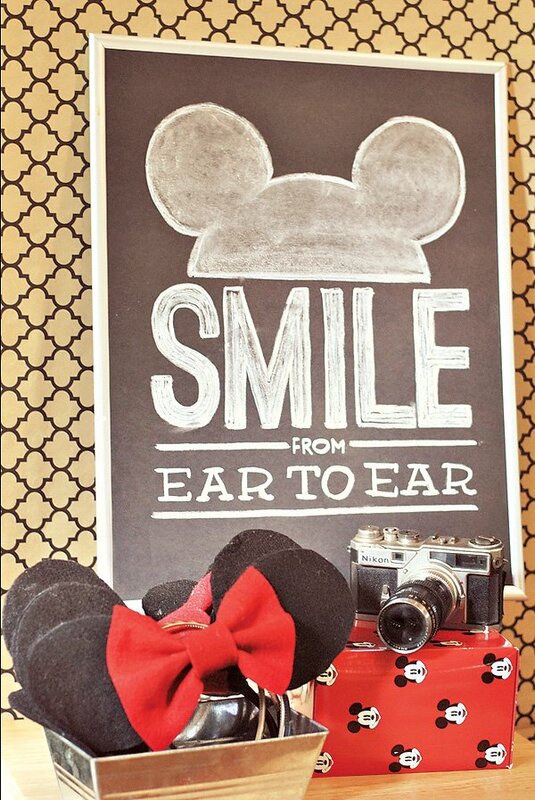 We had photo booth set up with a chalkboard sign that read, “Smile from Ear to Ear” that was displayed along side my vintage Nikon camera. The photo booth backdrop fabric was an incredible thrift shop purchase that only cost a dollar. 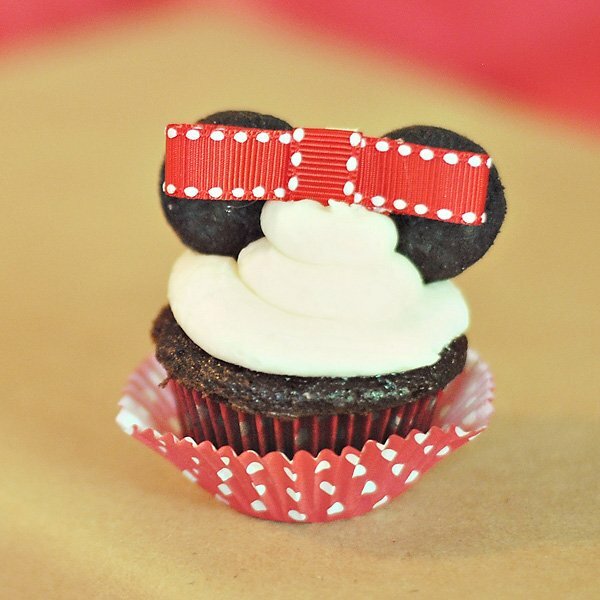 I made several pairs of felt Mickey & Minnie ears for our guests to wear when they had their pictures taken. Everyone had fun posing & being silly. We later included the photos as black & white 4×4” Instagram prints in their thank you cards. I can’t even pick a favorite part everything is just darling!!! 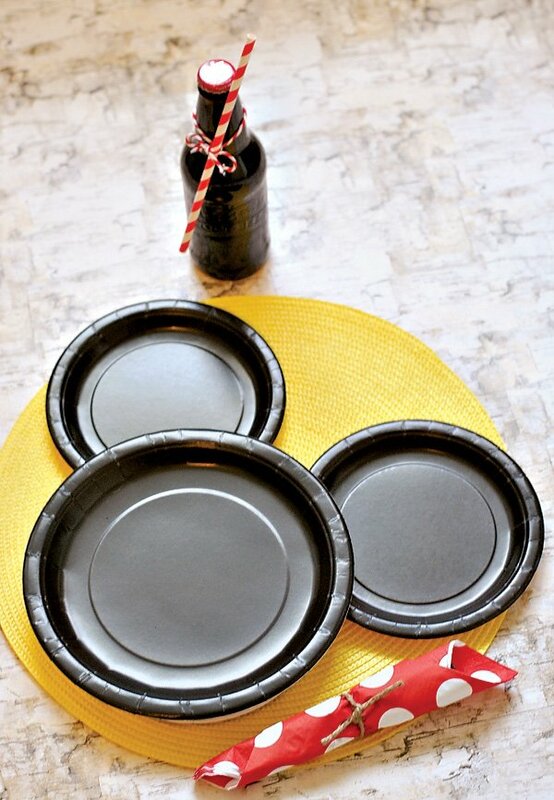 I love the cake-topper, and all the chalkboard printables….but that place-setting with the black paper plates! So simple and so perfect! Love, Love, LOVE THIS!!! 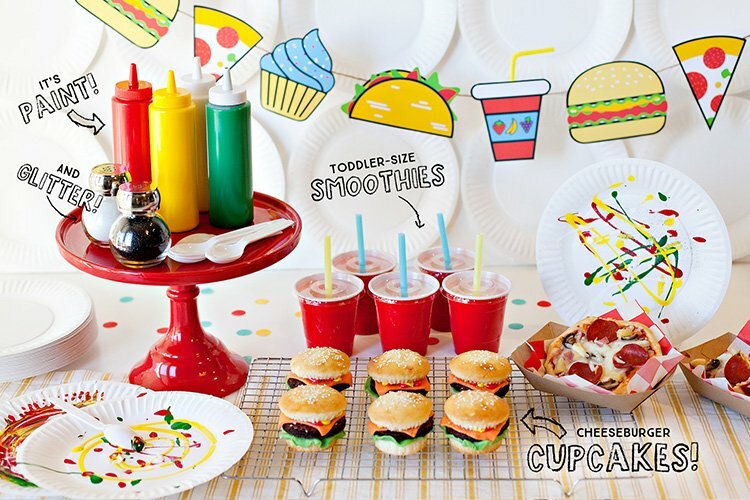 So cute and very creative! Love it! 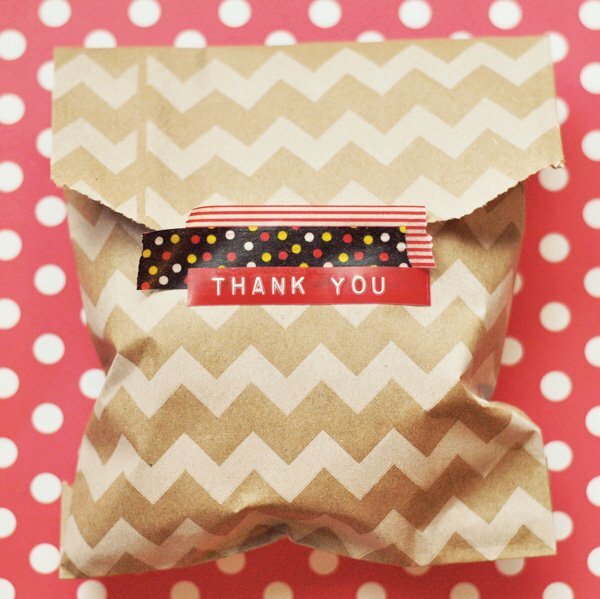 Currently hunting high and low for the thank you tape for the bags! My son is also having a Mickey Mouse 3rd birthday next month… BTW we just got him and early 3rd birthday present – A mini doxie named Hudson! Hi! Love the Oreo pops! Can you please tell me what you used to make them? Hi, I love the Oreo pops! Can you please tell me what you used to make them? Did you make the popcorn yourself or did you buy it? Do you have the recipes? 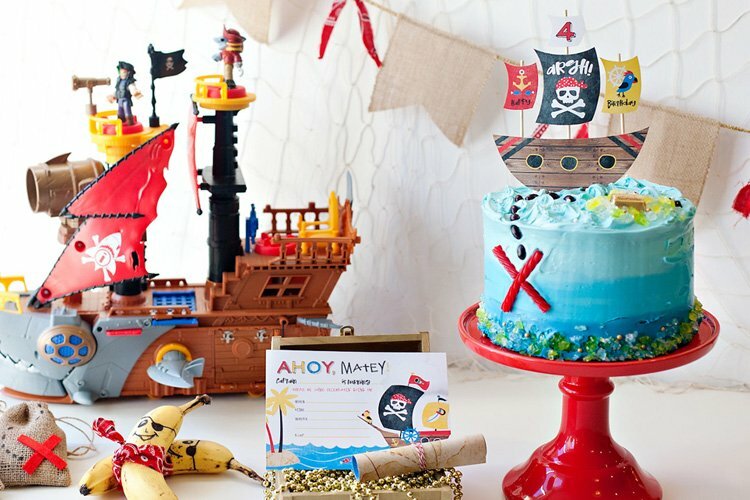 Where did you get the clothes pin cake topper made? 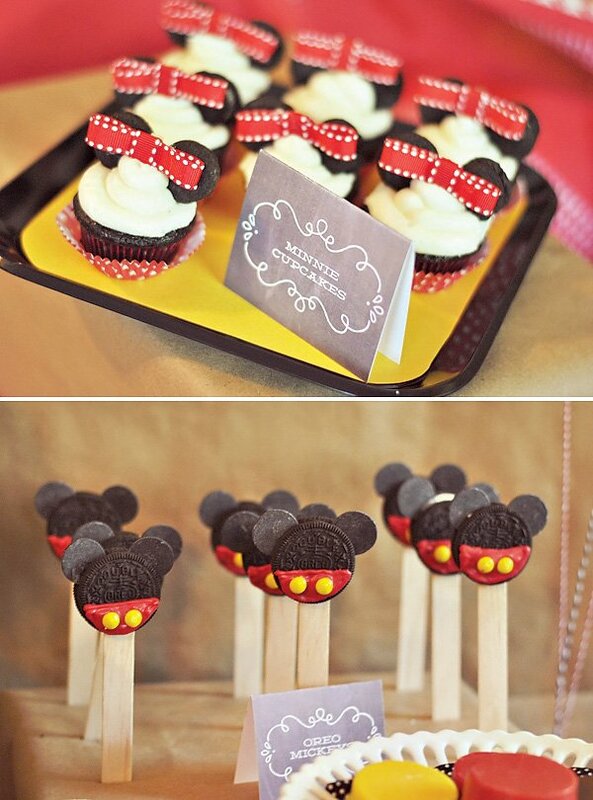 I would LOVE to get one made for my daughter’s minnie mouse birthday party. 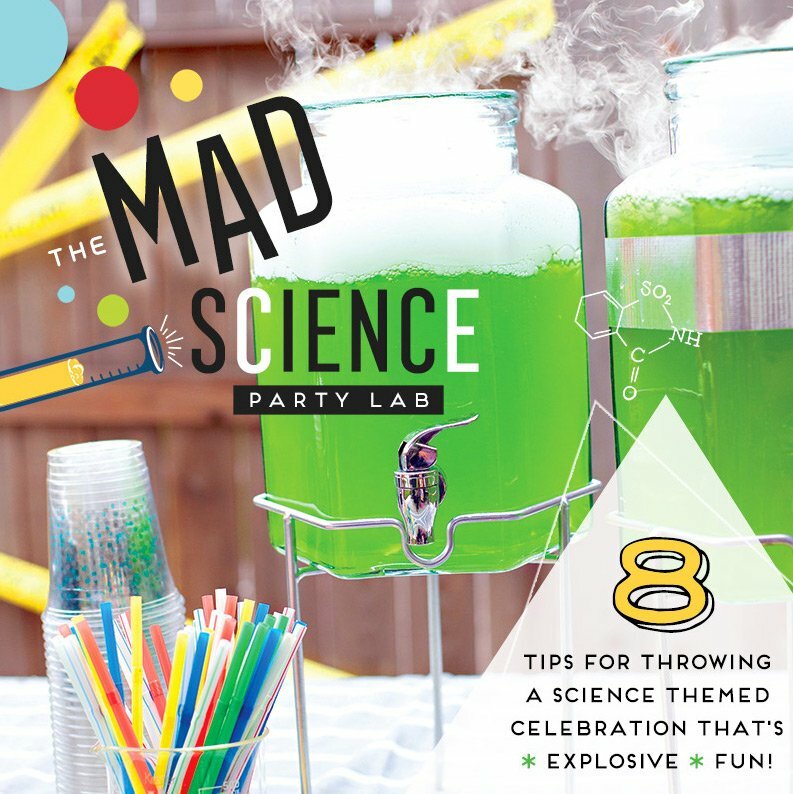 Love the theme and ideas! My LO will be one! MMCH theme! Can I buy the fabric from you? Not sure why it didn't work well while typing! 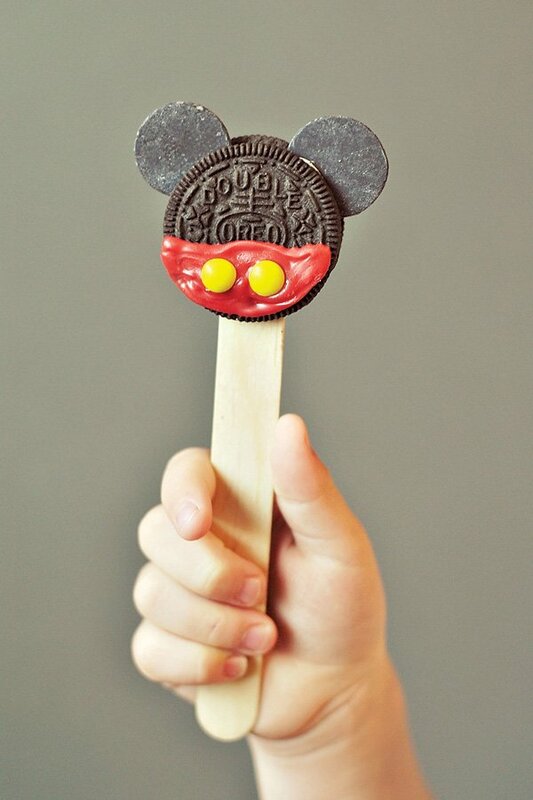 How do you make the Mickey Mouse Oreo lollipops? How do you get the stick attached so it stays on? Thanks. Where did you get the cake topper? That is too cute! 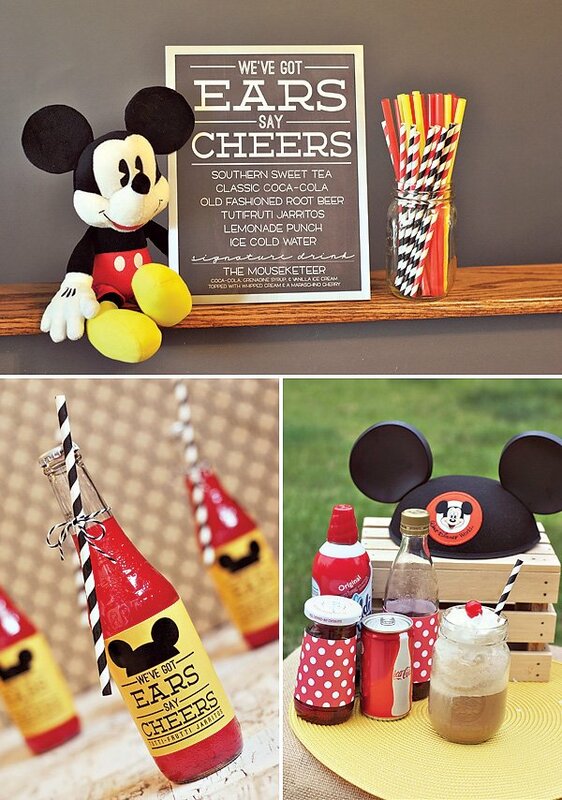 We are having a Mickey party soon and I would love to have one of those too!